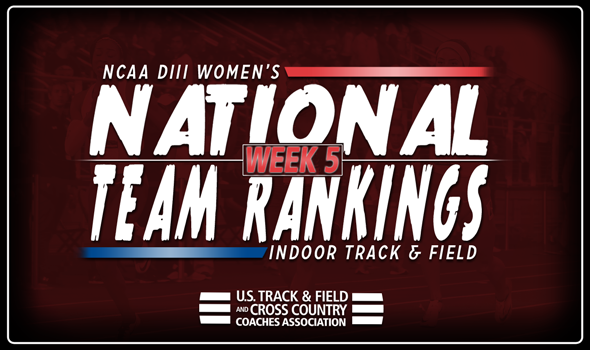 NEW ORLEANS – Everything changed in the most recent NCAA Division III Women’s Indoor Track & Field National Team Rankings that were released Tuesday by the U.S. Track & Field and Cross Country Coaches Association (USTFCCCA). No team remained in place between Week 4 and Week 5 as the track & field gods put the index in a blender and pressed shred. The new-look top-5 looks something like this: No. 1 Williams, No. 2 MIT, No. 3 UMass Boston, No. 4 Ithaca and No. 5 George Fox. This is the third time this season that the Ephs owned the top spot. Williams added 55.75 points to its total from Week 4 to Week 5 thanks to huge marks from Emma Egan and Summer-Solstice Thomas in the high jump (tied at No. 1 nationally) and Egan alone in the pentathlon (now ranked fourth with 3461 points). The Beacons hit the best ranking in program history thanks to a national top-10 mark that Wadeline Jonathas had a part in. Jonathas and three of her teammates recorded the sixth fastest 4×400 relay time of the season at 3:55.08. Bates jumped six spots from No. 13 to No. 7 and will be looking to Katherine Cook to deliver big points in the postseason. Cook is ranked No. 1 nationally in the 5000 and just added the seventh best mark in the 3000. Sally Ceesay recently hit the nation’s second best mark in the triple jump (11.97m/39-3¼), which added 20.50 points to Bates’ team total. UW-Eau Claire and UW-La Crosse led the way for a quartet of Wisconsin programs in the rankings. The Blugolds went from No. 12 to No. 10, while the Eagles went from No. 14 to No. 12. Further back, UW-Whitewater went from No. 22 to No. 17 and UW-Oshkosh jumped from No. 23 to No. 19. There is only one new team to the top-25 this week and that is Bethel (Minn.). It wasn’t that big of a jump for the Royals as they went from No. 26 to No. 25, but it is just the third time in the past nine years that the program has been ranked in the top-25. These rankings will probably change again the next two times as we near the 2018 NCAA Division III Indoor Track & Field Championships, which will be held March 9-10 in Birmingham, Alabama.